Did you know that toothbrushes have existed for almost 5000 years? Well, at least that’s if a thin twig with a frayed end called a “chew stick” counts as a toothbrush. The common nylon-bristled toothbrushes we use today were invented in 1938. In today’s world, you are met with dozens of choices of toothbrushes when you go to the store. It can be overwhelming and confusing when so many types exist. Here is a quick guide to common types of toothbrushes and how to choose one that works best for you. Select a size that works for you. For adults, the standard toothbrush head size is a half-inch wide and one-inch tall. Larger heads make it hard for you to access all parts of your mouth. For babies, you can get very small heads designed for baby teeth. For small children, you could consider buying a toothbrush with a larger handle that makes it easier to grip. Soft, medium, or hard bristles. For most people, soft brushes are the best option and will be the most comfortable for you teeth. Hard bristles can damage your gum tissue and expose the tooth root, which can make your teeth more sensitive. Look for toothbrushes with an ADA Seal of Approval. This approval from the American Dental Association guarantees that the toothbrush has safe bristles, can effectively reduce plaque build-up, and can withstand brushing. A common question is if you should use a manual or an electric toothbrush. With the right method and frequency of brushing, manual toothbrushes are usually enough for great dental care. It’s inexpensive and easy to travel with, but for people who aren’t very good at brushing their teeth, electric brushes can be the solution. These brushes, although more expensive, usually have features built in that can help with your brushing, such as a timer or sensitive teeth mode. The AMA also encourages electric brushes for people with limited manual dexterity, like those who have arthritis. 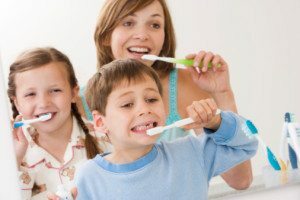 The bottom line is that both types of toothbrush can provide good dental care as long as you follow the right brushing techniques and with the right frequency. Did you know that you can now get a toothbrush that has Bluetooth capability and can connect to your smartphone? It’s true – for $160, you can purchase the SmartSeries Bluetooth toothbrush by Oral-B this upcoming fall in the United States. With the supporting smartphone app, you can track your brushing and the app makes sure you brush your teeth for the recommended two minutes. It also reminds you to switch between quadrants of the mouth and gives you news and dental tips on the side as you brush your teeth. While the toothbrush and app doesn’t guarantee good dental care, it makes it easier for you to remember how long to brush your teeth for and entertains you while you do it. Of course, a good toothbrush will do nothing without healthy brushing habits as well. Feldmanis Family Dentistry, your kids dentist in Eugene recommends a minimum of two-minute brushings twice a day and flossing once a day. Schedule an appointment with us today! Feldmanis Family Dentistry offers a wide range of general and cosmetic dentistry services for patients of all ages.